CovaChem's mission is to deliver exceptionally high quality products for use in research, while leading the industry in value. Our technical representatives are ready to assist you in method and assay development. Our driven team of scientists with decades of experience aim to provide our customers with the best quality product delivered promptly. Expect more, while extending your research dollar further. 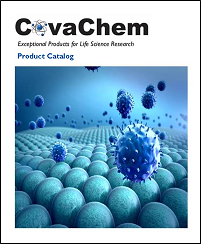 CovaChem's product portfolio includes products for protein research and proteomics, UltraHigh Purity LCMS mobile phases, GC derivitization reagents, other chemicals used in life science research, purified enzymes, and custom organic synthesis services. CovaChem's product offering is continually being updated. If you are looking for a particular product not listed on this site, please call or email our customer service group for availability and pricing. We would be glad to help. As always, please let us know if we can do more to assist you with your research needs. For a print copy of our catalog or other product literature, call or email our customer service department. Disuccinimidyl Glutarate (DSG) is a homobifunctional crosslinker that contains two NHS esters that are reactive towards primary amines. LCMS Grade Formic Acid (CAS# 64-18-6) from CovaChem is of Ultra High Purity ideally suited for sensitive LCMS and HPLC applications. LCMS Grade TFA (Ultra High Purity) from CovaChem is well suited for HPLC and LCMS applications, where separations are difficult otherwise. CovaChem's LCMS Grade water is refined for optimal performance in mass spectrometry applications. Sulfo-SANPAH is a heterobifunctional crosslinker with a Sulfo-NHS and nitrophenyl azide group each end. Bis-sulfosuccinimidyl suberate (BS3) is an amino reactive, homobifunctional crosslinker. BS3 is water soluble and membrane impermeable. Synopsis: This article describes the reaction of Sulfo-NHS esters with proteins and peptides in buffered reaction systems. Several of the key reaction concerns are covered here. This post is intended to provide some background for protein research scientists before planning experiments involving this class of compounds. Synopsis: This article describes some of the useful features of the homobifunctional crosslinker 3,3'-Dithiobis(sulfosuccinimidyl propionate), also known as DTSSP.